May 17, 2011 May 31, 2012 Nefer Khepri, Ph. 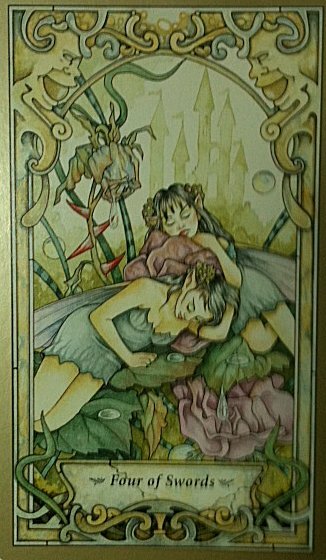 D.
From , The Mystic Faerie Tarot, by Linda Ravenscroft, Guidebook by Barbara Moore. Llewellyn, 2007. First Edition, First Printing. Having experienced illness or perhaps just a trying time, one faery cradles another in an attempt to comfort her. We all have them – those days that are just totally “blah” when nothing seems to work out and we can’t get motivated to do much of anything. Energetically, many of us are coming out of such a time period. This card is saying that the going has been slow in relationships, finances, and making new plans. However, the energy is shifting and if we just give things a bit more time they will begin to move forward again and we can look forward to things flowing along as usual. Down periods are good times for self-reflection and sometimes enforced relaxation for those of us who can’t seem to sit still. Take the time to relax and know that busier times are just around the corner. THIS DECK IS FOR SALE. It has its original packaging including a gold organza bag in which to place the cards. I never used the deck so it’s in pristine condition, the guidebook as well. Originally retailing for $24.95, it is on sale in perfect MINT condition for $18.00, including shipping/handling in the domestic US. For all other countries the price is $30.00, including international shipping/handling. Previous New Service Debuting This Weekend!